Rodion Schedrin is an interesting composer, a member of the generation after Shostakovich. His music is never dull: he has an assured technique, an ear for orchestral effect and colour, and a particularly sharp and pointed wit. Many of these attributes are those which we would readily link with his illustrious predecessor. Shchedrin is always likely to be best known for his remarkable ballet adaptation of Bizet's Carmen, scored for strings and percussion with astonishing imagination. It really does breathe new life into the music, and should be viewed as a creative act of homage rather than merely an arrangement. The music has such inventiveness and energy that it has started making an international impression as a concert suite, and rightly so. Therefore a recording with excellent sound, as heard here, will give much pleasure to the listener away from the theatre. 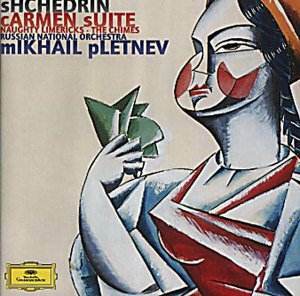 Pletnev and his brilliant orchestra bring a vibrant intensity to their performance, which has a real dramatic sweep. Although this is in no way a substitute for Bizet's original - how could it be? - it is worth hearing in its own right. The two concertos of orchestra are very different. The first of them, entitled 'Naughty Limericks', is a lively tour-de-force, with pounding jazzy percussion which sweeps all before it. This is music of great élan which makes a direct impression at first hearing. Not everyone will necessarily like it, but those who warm to zany orchestral experiences will love it. What's wrong with vulgarity in music, anyway? The other Concerto, known as 'The Chimes', is altogether different. Here the expression is darker, as the initial phase of slow moving atmospheric chords immediately tells us. Then the development is powerfully expressive and exploratory, building also a rhythmic intensity founded upon virtuoso orchestral playing. The bell sounds implicit in the title come through 'in clear' from time to time, as the composer explained in the programme note he wrote for the New York premiere in 1968: 'Throughout Russian history, chimes have always been important to our people. The chimes of ancient Russia represent a very particular feature of old Russian civilisation.' This work was written for Leonard Bernstein and the New York Philharmonic: no wonder orchestral virtuosity combines with a nationalist style. With richly colourful sound, these compelling works will give much pleasure to those who enjoy the wider range of possibilities modern music offers. For those of more timid tastes, the experience will be vibrant and direct.